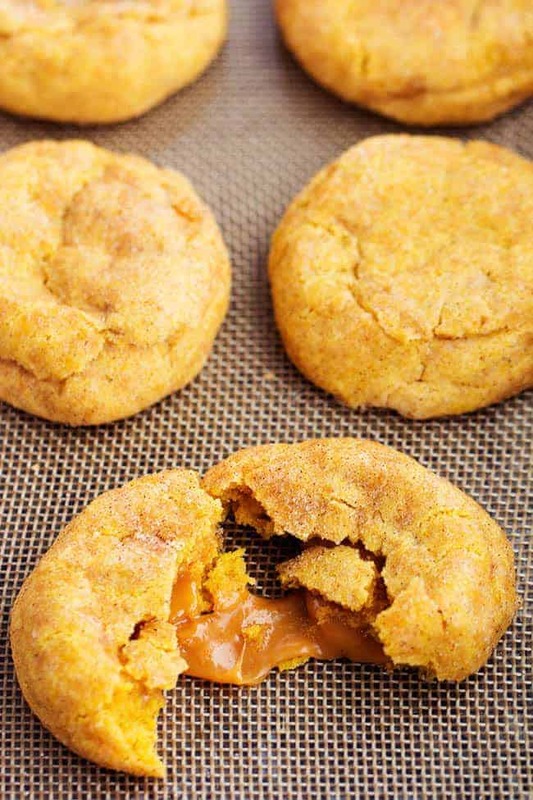 A soft and puffy pumpkin snickerdoodle with an ooey gooey caramel center. These are some of the best fall cookies that I have ever made! Snickerdoodles are easily one of my favorite cookies. I absolutely love these Pumpkin Cheesecake Snickerdoodles that are on the blog. 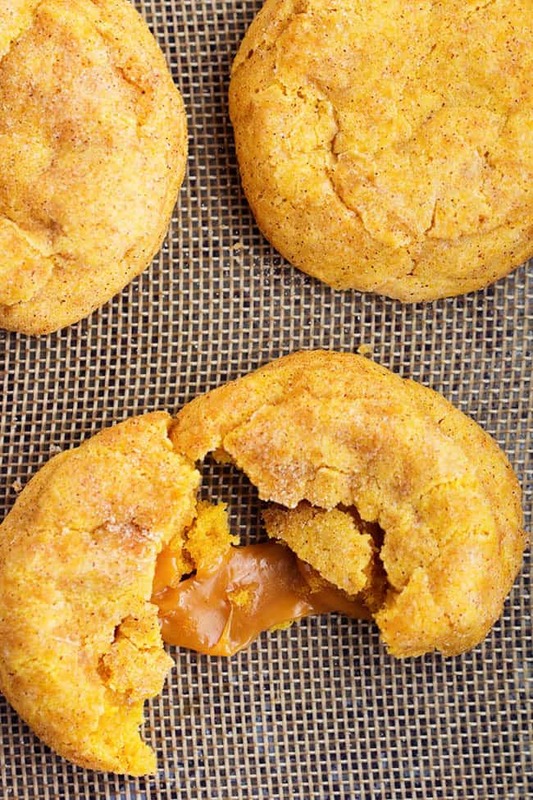 Biting into a soft pumpkin cookie with a surprise center is amazing! I wanted to bake these cookies for a Halloween treat. But instead of filling the inside with a cream cheese center I decided to use caramel. 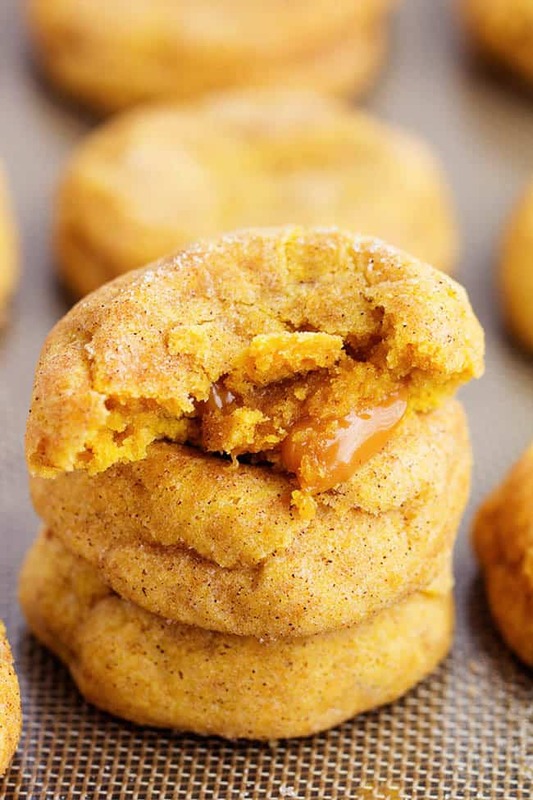 If you like pumpkin and caramel… these will be life changing! To make the cookies, take a tablespoon of the cookie batter. Flatten it like a pancake and place a caramel in center. Form another tablespoon of the cookie batter into a flat pancake shape and place on top of the caramel. Pinch the edges together sealing in the caramel and roll into a ball. Roll in the cinnamon sugar coating and place on the prepared baking sheet 2 inches apart. *The cookie dough will be slightly sticky. If you need to lightly flour your fingers you can. *I have found that if you flatten the caramels just a bit they melt easier. These snickerdoodles look and sound heavenly! Oh my goodness, Alyssa! These look amazing!! I would make them right now if I had caramels on hand. This is happening tomorrow!